if you've been in the blogging world for any length of time, it's likely you've heard about lisa leonard..
or at least SEEN a piece of her jewelry on someone else's blog. and watched as her jewelry business has flourished..
and i have ALWAYS ALWAYS loved her pieces. but.. i always had a hard time nailing down which piece i loved enough to purchase. 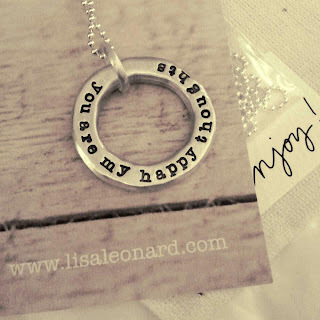 then, to my surprise, i won a giveaway from epiphanie camera bags right before christmas..
and along with another amazing gift..
i won a gift card to lisa leonard designs! to say i was excited would be an understatement, for sure. i started right away trying to narrow down what piece i wanted. to replace the one i had worn almost daily with mason's name on it..
well, you can see i decided on getting one with the boys names on it! it's the open circle necklace. this thing is hefty & solid & absolutely amazing in person!! the front, as you see, has the boys names on it..
i wasn't sure it would mean anything to anyone other than myself..
even knew it was from 'hook'. but more precisely, it's from 'peter pan'. like every mama, i love these kids more than words can express..
i wanted something different than 'love you', 'xoxo' or something similar. when i'm sad or down.. these kiddos lift me up. or wondering where i went wrong because i can't get mason to listen to save my life..
and i remember how truly fortunate i am to be blessed with these two little guys. and with a sprinkle of house dust (cause the fairies are scarce in a house full of boys)..
and a few happy thoughts..
my spirits start to rise. life is full of more blessings than burdens... you just gotta know which angle to look from. ps. if you aren't familiar with lisa leonard, or her blog.. i encourage to you click on over & find out a little about her & her story.. it's an amazing story, for sure... and one that may change you. 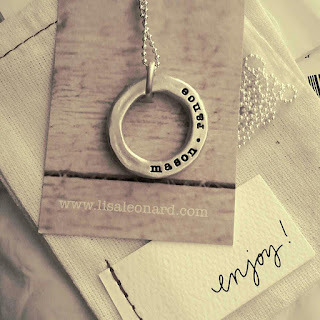 Oh I'm loving this necklace, so sweet. I got some rings with the boys name too...and I hang them on a necklace instead of wearing them on my hand. I super dig how this one is two sided...really cute!